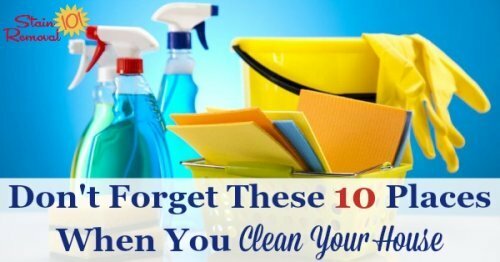 Here is a list of 10 often forgotten places to clean, so you remember when you clean your house. When we're doing our everyday cleaning we can get into a routine or pattern, and can easily forget about some places around our home that should get cleaned. These forgotten areas in the home are the kind that don't jump out at you because they're out of sight, or they aren't as noticeable on a regular basis, but they do get dirty like everything else. 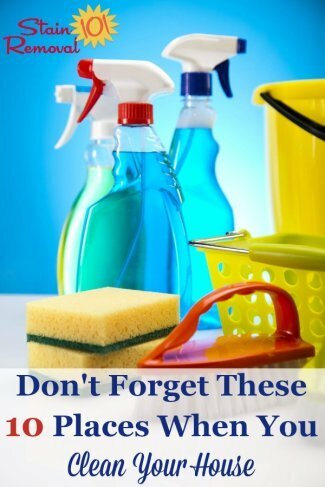 Therefore, add this list of 10 often forgotten places to clean in your home to your weekly, monthly or seasonal cleaning schedule to keep these areas as tidy as the rest of your house. While you are sweeping, mopping and vacuuming you may not notice things like dust or dirt behind doors that are often kept open. Make a point when cleaning or vacuuming the floor to move the door from either open to closed, or vice-versa, during the cleaning process, so you can clean all around it. You may store your cleaning supplies under the kitchen or bathroom sink, but do you ever actually clean under it? While this area spot may not need as much elbow grease to clean, it is important to wipe down the area and inspect for leaks periodically. Make sure things are well organized and check for any signs of pests, like mice, roaches or ants. 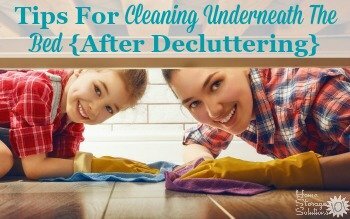 It's always easier to clean this area when it is decluttered, so check out these tips for decluttring under the kitchen sink here, and also decluttering under the bathroom sink here. Underneath and behind appliances is a place that often gets overlooked, but can accumulate some serious dust and dirt with time. 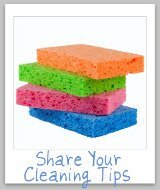 Add this cleaning task to your spring cleaning list as a way to not only get rid of dirt and grime, but to protect your investments. Appliances often can have problems operating properly if there is a build up of dirt and grime underneath or behind them. Since it is a safety hazard, it's important to make sure this is cleaned regularly. 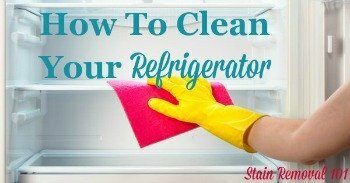 Check out these tips for cleaning your refrigerator here, which includes a section about cleaning the refrigerator coils and areas underneath and behind this essential household appliance. We clean the toilet itself and the front of the floor around it, but do you ever reach behind the toilet to wipe things down? Like other parts of the toilet, dirt and grime can build up on the back of the tank or behind the toilet bowl. It's more difficult to reach, but a quick wipe with a cleaning wipe will do the trick. It may also help you solve some of your unknown bathroom smell issues when you clean around the base of the toilet well. Not only do you want to remove the lint from the lint trap inside the dryer, it is important to occasionally look in the dryer vent that leads outside to make sure it is not clogged up either. Clean this vent on a regular basis with a dryer vent cleaning kit, because a clogged vent is a fire hazard. Your vents, either on your floor, ceiling or wall, may not be noticed much as you clean, but they too could use an occasional cleaning. Kids are also notorious for dropping things like change, crayons or small toys down into vents in the floor, and lots of dust seems to accumulate on ceiling vents. Take the time to not only wipe all these vents down, but check and make sure nothing has been dropped into the ones on the floor. If your vents are hard to reach, I suggest a duster with an extendable handle to be able to reach either high or low places. Dust bunnies are often found under beds when they are moved, plus you may find all kinds of items you thought were lost for good once you finally look under there. Not only should you be checking under your bed, on a regular basis, for lost items, as well as for evidence of household pests, but in addition, you sholuld use the attachment on your vacuum to quickly remove dust as well. Cleaning under your bed with reduce the overall dust in your bedrooms, as well as make it easier for sleepers to breathe at night, especially anyone that suffers from dust allergies. 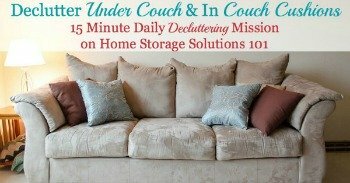 You can read tips on the sister site, Home Storage Solutions 101, about how to clean underneath your bed after you declutter. Kids and pets tend to hide things under furniture, not to mention things rolling under these large items on accident. Whether it is a toy or the dreaded green beans they didn't want for dinner (and yes, that did happen in my house! ), it's a good idea to move things like couches, chairs and other furniture around and inspect underneath a few times each year. Who knows what you'll find! When you move these items also give the floor a good cleaning at the same time, with a vacuum, dust mop or regular mop, to clean excess dust and grime that has accumulated with time. Much like under the furniture, beneath the couch and chair cushions, and in between them, you may find a treasure of misplaced hair ties, loose change and any number of food crumbs. Remember to lift these and not only vacuum under them, but also rotate and fluff them for proper wear. Get more tips for decluttering and cleaning your couch cushions here. While you may think to wipe down the cabinets on occasion you probably forget to run a cloth under the edge of those lower cabinets. Dust and pet hair can build up underneath leaving them dirty. Grab a damp cloth and wipe them down to remove any dirt and dust trapped there. In addition, about once to twice a year safely get on a step stool or safety ladder and dust and remove grime from above your kitchen cabinets as well. What areas in your home are you surprised get so dirty? I'd love to hear in the comments below. 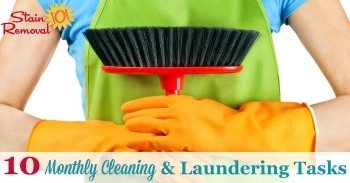 Next, check out this article with 10 monthly cleaning and laundering tasks for your home. Are you doing all these things frequently enough? 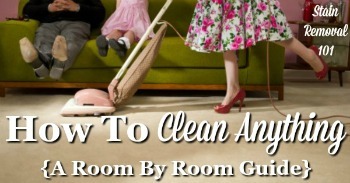 In addition, get more tips for how to clean just about anything here, in the site's room to room guide.